Đorđe Bojović is a research associate at the Centre for Contemporary Politics and MA candidate at the London School of Economics and Political Science. Nikola Burazer is the programme director at the Centre for Contemporary Politics and the executive editor at European Western Balkans. Indeed, the Strategy brought some fresh air to the EU’s enlargement policy, almost four years after Commission President Juncker’s proclamation that the EU won’t accept anyone during his mandate, which cemented enlargement fatigue as the new normal. In spite of that, with the significant exception of North Macedonia after the ratification of the Prespa Agreement, the major switch in February 2018 did not translate into concrete results in the region. The current impasse in the Serbia-Kosovo dialogue is an emblematic example of the Western Balkans’ instability. The two sides have held continuous negotiations since 2011, which resulted in the landmark 2013 Brussels Agreement. But a bitter taste remains about the non-implementation of some substantive provisions, particularly the establishment of the Association/Community of Serb Municipalities (ASM), which should have been the main concession given by the Kosovo side. The permanent contest of Belgrade and Pristina – the establishment of ASM and the recognition of Kosovo – came to a head in 2018. To understand the current deadlock, three main events need to be recalled, namely the “de-recognition” of Kosovo’s independence, the blocking of Kosovo’s membership in different international fora, and the imposition of 100% tariffs on Serbian (and Bosnian) goods by Kosovo’s authorities. Serbian diplomatic efforts to push the countries which have recognised Kosovo to “de-recognise” it culminated in 2018, with up to 10 countries (according to the Serbian MFA) withdrawing their official recognition, in exchange for some economic benefits, or a visa-free regime with Serbia. This process has been going on from the moment Kosovo declared independence in 2008 and consists of Serbia seeking to prevent Kosovo from joining different UN and other international fora, arguing that acceptance would reinforce Kosovo’s disputed statehood. Kosovo’s response to its failure to join Interpol in November last year, because of Serbia’s opposition, was to slap 100% tariffs on Serbian goods. According to Prime Minister Ramush Haradinaj, the tariffs will remain in place until Serbia fully recognises Kosovo. 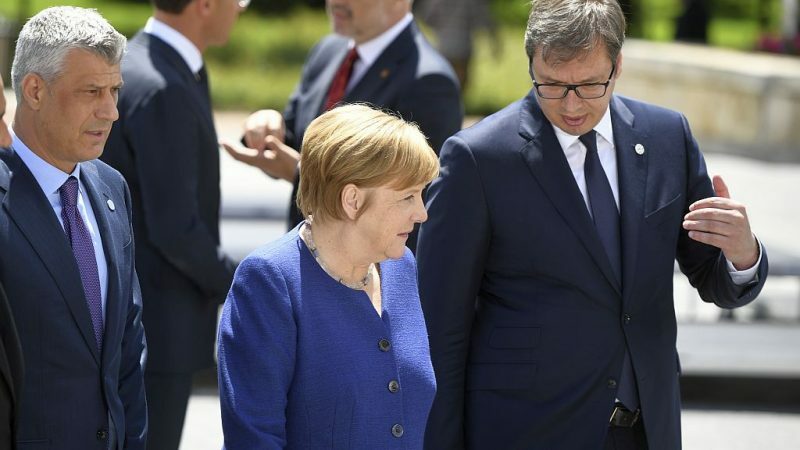 In parallel, the political agenda shifted in the summer of 2018, when presidents Aleksandar Vučić of Serbia and Kosovo’s Hashim Thaçi simultaneously promoted the idea of “border corrections” as a possible basis for the forthcoming normalisation agreement. Despite the heated political debates in the region and within the EU, this proposal gained significant direct or implicit backing from both US and EU officials. Since then, both presidents have been accused at home of holding parallel, secret negotiations, either directly or via proxies (the name of former UK Prime Minister Tony Blair has been mentioned). This led the Kosovo side to change the format of the dialogue by forming a new team for the negotiations endorsed by Kosovo’s Assembly and backed by Haradinaj, President Thaçi’s opponent. They officially took over all the documents and negotiating positions from Thaçi, saying they will never accept the land swap as an option for the final deal. On top of all the political backsliding in Serbia-Kosovo relations, the EU itself actively contributed to the present cul-de-sac. Besides full recognition, visa liberalisation for Kosovo has been perceived as the main incentive for it to take part in the normalisation process with Serbia. Kosovo undertook a number of efforts to fulfill the criteria, the main one being the ratification of a border demarcation agreement with Montenegro. Yet, the EU has not granted 1.7 million Kosovo citizens the visa-free travel regime, leaving Kosovo as the only remaining territory in Europe (except Belarus) with such restrictions. Moreover, the EU’s new push for an urgent conclusion of the normalisation agreement led to the disclosure of their trump card (land swap), which contributed to the current impasse, as the idea of land swap or border correction has not been widely accepted either in Serbia or in Kosovo. Although reaching a comprehensive legally binding agreement remains the condition sine qua non for European integration of both Serbia and Kosovo, none of them know how to decently get out of this deadlock. Despite the significant international pressure on Kosovo to withdraw the tariffs, the efforts did not have a major effect, as Kosovo sees the tariffs as its main tool to oppose Serbia. On the other side, Vučić stated that the Serbian side is ready to get back at the table as soon as their economic exchange is normalised. Even though it normally takes two to tango, the normalisation process must involve a third actor who will ultimately guarantee the implementation of the agreed positions. That’s why the EU should take a lead on this and bring the two sides back to the table. The EU needs to show that it is capable of solving the issues in its own backyard, and the Serbia-Kosovo dialogue is the prime example of that. With the European Parliament elections in May, it seems that the current European Commission is weakened when it comes to leverage over the two governments. This risks a further postponement of the conclusion of the normalisation process, as it remains to be seen how much attention the new Commission will pay to the Serbia-Kosovo issue. Therefore, in order to finish the EU’s and Federica Mogherini’s term as a mediator on a high note, the EU needs to find a creative way to make significant progress in the Serbia-Kosovo dialogue before the elections. Failing to do so may risk annulling significant achievements of the past few years and even undermining its entire Western Balkans policy.